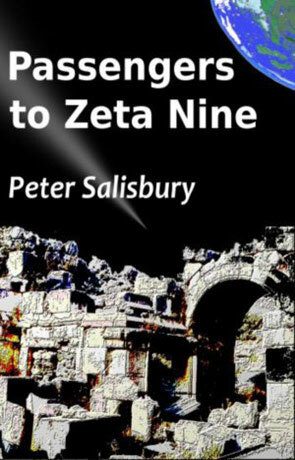 Passengers to Zeta Nine is a science fiction novel by Peter Salisbury, set within the same universe as Passengers to Sentience. Travelling for one hundred and twenty years, the minds of Raife and Nancy are electronically stored along with six hundred other couples aboard the ship Explorer, bound for the human habitable planet of Zeta Nine. They will be the very first humans to see this lush and welcoming planet which appears to have an abscence of large predators, biohazards or civilisations. Everything looks perfect but is it too good to be true? I must admit that I really enjoyed this novel, it's written in a very friendly and easy to follow script that relies on characterisation rather than back story or science fiction convention to move the plot along. The idea that we could travel to other planets by having our selfs stored electronically and then downloaded into a freshly vat grown clone body is a very intriguing way to get round the problem of the vast distances and times required for such a journey. For Raife and Nancy this trip took just a few minutes and were not aware of the 120 years the automated ship took to arrive at their new destination. There has clearly been a great deal of thought over just how we could explore and eventually colonise a remote world, the science is very plausible and explained in a way that avoids descent into technobable and disruption to the plot. I love the idea of the robot spiders and the self replication technology that we have very recently seen emerging from scientists labs (in the very earliest of forms like the 3d printers). It's a great way of expanding on the idea's raised in the first book and works very well here. The story follows Raife, Nancy and others as they begin to explore this strange alien world and is very much involved in the minutiae of these peoples lives. As such there is a very relaxed and comfortable pace to the novel but there is also a distinct lack of any real danger for the most part - but when someone can be downloaded into a new body after they die the fear of death would lose it's edge. While there isn't much in the way of action the novel is written with a great degree of intelligence and imagination, such that I really found myself wrapped up in these people's lives and very much looking forward to see what happens next and enjoying their discoveries as they explore the planet. The alien world is described in excellent detail and feels almost like the author is describing a place he has visited rather than one in his imagination. I was a little disapointed with the ending, there is a general build up in the last quarter of the novel and I felt that it was going to culminate in a grander discovery than it did, nonetheless i really did enjoy reading Passengers to Zeta Nine, it's a relaxing, rewarding and ultimately captivating example of extra-planetary exploration. Written on 7th April 2011 by Ant.